Wow, I can't believe I missed this obit until now. Chris Condon, producer and cinematographer of The Stewardesses (1969), passed away on Dec 19 in Encino, California after suffering a stroke at the age of 87. Condon is best known in the 3-D world for designing stereoscopic lenses (through his company StereoVision Entertainment) that could be used with a single camera. The Stewardesses was a phenomenal hit, banking over $25M despite its budget of just $100,000 and its vignette style story telling that was extremely light on plot and heavy on soft core sexploitation. His lenses were used on a number of 70's features including Flesh For Frankenstien (1973) and into the the next decade. 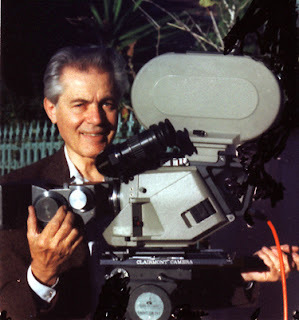 He served as a stereoscopic consultant on Owensby's first 3-D film Roitwettler: The Dogs of Hell (1982) and he consulted on many more films through the eighties 3-D boom; Parasite (1982) and Charles Band's empire building film Metalstorm: The Destruction of Jared Syn (1983), and the Universal Studios release Jaws 3-D (1983). Together with Joseph Mascelli the authored the American Cinematography Manual of The American Society of Cinematographers. I don't know if you were aware, but we also lost 3-D pioneer Dan Symmes in September of 2011 to a heart attack. I first heard of him in 1982 when I got a copy of Amazing 3-D, a book he co-authored with Hal Morgan. I got to meet him at the 2nd Hollywood 3-D Film Fest, where I also got to see Chris Condon and some of his stereoscopic pre-September 11 footage of New York. They will both be missed.